Institute manager Paddy McLaughlin feels his side have been handed a tough Tennent's Irish Cup fifth round draw against Warrenpoint Town. McLaughlin was also quick to point out that having home advantage is a benefit to his side. Institute's Jake Morrow (centre) pictured alongside Warrenpoint Town pair Seanna Foster and Matty Lynch at today's Tennent's Irish Cup fifth round draw. Elsewhere in the competition the tie of the round sees Crusaders host Belfast rivals Glentoran; in another all Premiership clash Cliftonville take on Dungannon Swifts; holders Coleraine start their defence against H&W Welders and Linfield entertain Ballyclare Comrades. 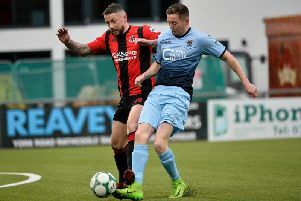 Premiership leaders Ballymena United travel to in-form Bluefin Sport Championship side Dundela, while Limavady United face Larne Tech OB, junior out-fit Maiden City travel to Ivan Sproule's Dergview, Glenavon have home advantage over Rosemount Rec and Strabane Athletic make the trip to Knockbreda. All ties will be played on Saturday January 5, 2019.